Animation of 2008SE85 asteroid, as it moves through the stars (Credits: ESA/Erwin Schwab). Amateur astronomer Erwin Schwab was determined to find it. The potentially hazardous asteroid 2008SE85 had disappeared shortly after its September 2008 discovery by the Catalina Sky Survey. Following a few observations in October 2008, the asteroid had seemingly disappeared, predictions for its orbit clearly inaccurate. But in September 2012, Schwab finally located the lost space rock. Schwab found the asteroid about 2 degree from its predicted location. His hunt was sponsored by the European Space Agency’s (ESA) Space Situational Awareness program. The discovery became official when it was acknowledged by the US-based Minor Planet Center. Asteroid 2008SE85 is 500 m in diameter and is not expected to strike Earth in the near future, as confirmed by the new observations. The object’s orbit has now been recalculated so it can be tracked in future. 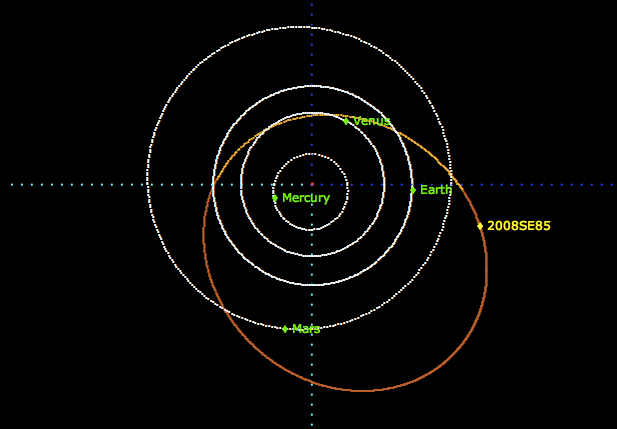 The orbit of Asteroid 2008SE85 takes it around the Sun about every two years. It’s 2098 approach was originally predicted to take place at 3 million km from Earth, but with the new observations, that distance has now been doubled (Credits: ESA/Deimos). Space Situational Awareness encompasses awareness of space weather, space debris, and near earth asteroids that can impact both Earth and space systems. Space agencies and militaries around the world collaborate in tracking such information, since hazardous conditions can impact everyone’s installations. The US military organization DARPA has just launched an amateur astronomer initiative as well, this one focused on tracking space debris. With so much to key an eye on, the more eyes watching, the better it is for everyone.